The Nashville Predators only have ten games left until the playoffs start. Nashville sits tenuously in second place in the Central Division, sandwiched between St. Louis and Chicago. The situation is even more complicated as the Blues have played one game fewer than the Predators and the Blackhawks have played two fewer the Predators. As March Madness is heating up, it is a good time to check out Nashville’s playoff prospects. If the regular season ended now, with every team catching up to the same number of games played at a modest one point per game, Nashville and Chicago would be tied, and Nashville has the tie breaker with more regulation and overtime wins than Chicago. With that, Nashville would have the favorable home-ice advantage for round one facing off against the Blackhawks (not a great team for the Predators to face). After the first round, the Predators would face the winner of the Blues and the Minnesota Wild — the Wild are 1–0–1 against the Blues this season. If the Wild win, the Predators would have home ice for the first two rounds. While the home ice advantage of the Predators off the start looks promising, the Predators have struggled against Chicago, going 1–1–2 so far this year, and 1–1 in Nashville. If Nashville makes it past Chicago, their next opponent, the winner of the Blues — Wild matchup, should be somewhat easier. 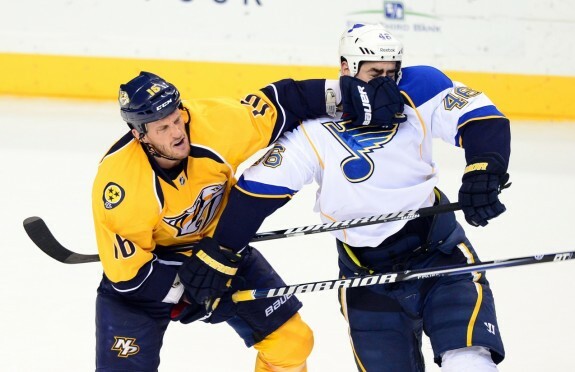 Nashville is 2–1–1 against Minnesota and 3–1–1 against St. Louis. Let’s consider a more realistic playoff scenario. We’ll take a look a the Predators’ remaining schedule and pick outcomes based on how the two teams matched up earlier in the season. With this approach, the Predators could end as strongly as 8–1–1 in the final ten games, picking up 17 more points to a total of 111, which would be the most in franchise history. If the rest of the Central also follows past performance through the end of the regular season, the Predators’ 111 would be enough for them to finish atop the Central, besting St. Louis and Chicago at 106 apiece. In the Pacific, Anaheim goes to a lofty 114 points under this model, putting them at the top of the Western Conference. This outcome would guarantee that Nashville stayed at Bridgestone arena for the first two rounds of the playoffs. Who do the Predators Want to Face? In the first round, the Predators are likely to face one of St. Louis, Chicago, Minnesota, Winnipeg, Los Angeles, or Calgary. To face Calgary or Los Angeles, the Predators would have to win the Central Division, a tough bout, no doubt. Between the two, however, the options look quite different. While the Predators are 3–0–0 against the Kings, they are 0–1–1 against the Flames, the best and worst records against likely playoff opponents. 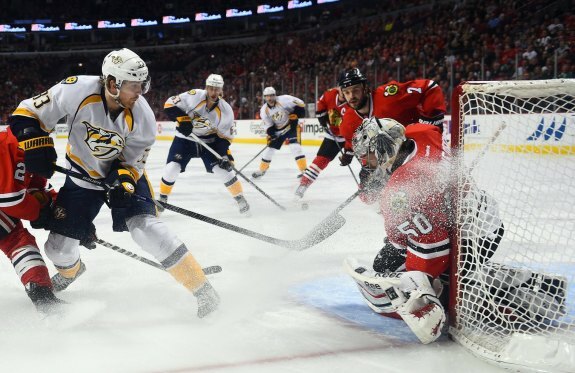 If the Predators don’t win the Central Division, (keeping Chicago and St. Louis at bay won’t be easy), then St. Louis is actually the best option for Nashville, who is 3–1–1 against the hot Blues, while their record against the Blackhawks is only 1–1–2, making them the worst option in the Central. The other two options from the Central, the Wild and the Jets, are comparable: Nashville is 2–1–1 against the Wild and 3–2–0 against the Jets. Nashville’s prospects in the playoffs look promising. Their final ten games could put the Predators back on the high note that they have been on most of the season. Depending on how the rest of the West shapes up, they could face one of six teams in the first round, and they have winning records against four of them, giving them an opening for a run for the cup.